Regular readers will know we always keep a close eye on Christies. Ok, you can get some bargains on eBay, but you can get some with the big auction houses too – and they come with a guarantee of authenticity. An interesting auction coming up is Shipping and Vintage posters. If you want a classic 1930s image of a holiday playground, an ad for an airship trip or a classic cruise poster, you can get them from around £200 up to several thousand – dependent on the imagery and fame of the artist. 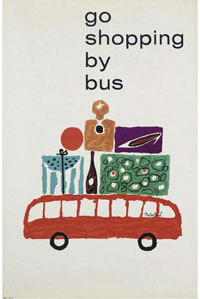 But dig deeper and there’s some slightly quirkier posters – more affordable and undoubtedly more shrewd investments. Take the posters by British artist and designer Royston Cooper. Famous for his "Keep Britain Tidy" poster (up for sale here), you can get some great 50s and 60s cartoon imagery from the artist, like this advertisement for the bus, at prices that aren’t going to clear out your bank account. But in a few years time, they might well fill it.